Broadcasts are an important way for teams to be able to push important information to other team members. Similar to an amber alert, it's often used to send safety alerts, updated instructions or directions, and important team updates from management to deskless teams. Broadcasts also include metrics such as read receipts, allowing senders to see who has read a broadcast, who has clicked through a link and when this was done. It's imperative that there are controls around who can send what information to your teams. This is all determined by admin roles. Learn more about admins and their access levels. and how to make a user an admin. Can edit, send, and expire any Broadcast they send. Can edit and expire any broadcast that any other admins have sent. Can send to any folder, any Official Group, any individual within their organization. Can send to any list they have created. Can edit, send and expire any Broadcast they send. Can send to any Official Groups that they are admins of. Can send to any list, folder or groups they have created on their own, or been given permission to. Must be part of a group, or given permission to a group by the admin before they can send broadcasts to that group. There is an additional option for Organization Admins to allow Team Admins or Broadcasters to have All Organization Access. 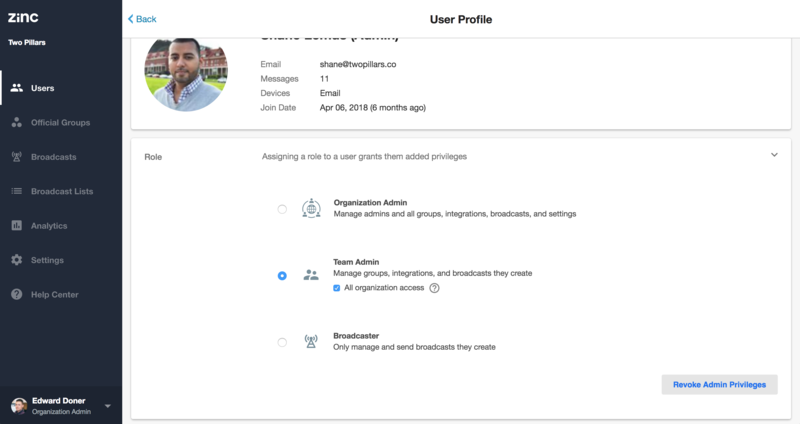 It is listed under Admin, and if chosen, Team Admins, or Broadcasters have the right to broadcast to any Official group or Folder in the organization, making it more flexible for team members with Broadcast responsibilities to easily reach who they need.